Former New York City Mayor Rudy Giuliani told those attending an event hosted by the Organization of Iranian American Communities at the National Press Club on Wednesday that President Donald Trump changed American foreign policy with one tweet in support of protests taking place in Iran. “And what it said was that we support the protesters in Iran,” Giuliani said. “That is exactly what Ronald Reagan did years ago when there was an uprising in Poland,” Giuliani said, referring to the Solidarity movement that fought the communist regime in that country. Giuliani said that, despite attempts by the Iranian regime to say it has quelled the protests, they are ongoing, and he believes oppressive governments always eventual crumble. The focus of the event was to discuss what the United States could do to help the protesters achieve regime change. Giuliani said the U.S. should support the opposition to Supreme Leader Ayatollah Khamenei’s oppressive government in Iran and in the United States. That support can range from helping Iranians inside that country have access to the Internet to implementing more sanctions, he said. Giuliani also discussed what Iran would look like if it becomes a secular democracy as the protesters hope, including the possibility of Maryam Rajavi, the president-elect of the National Council of Resistance of Iran (NCRI), coming to power. 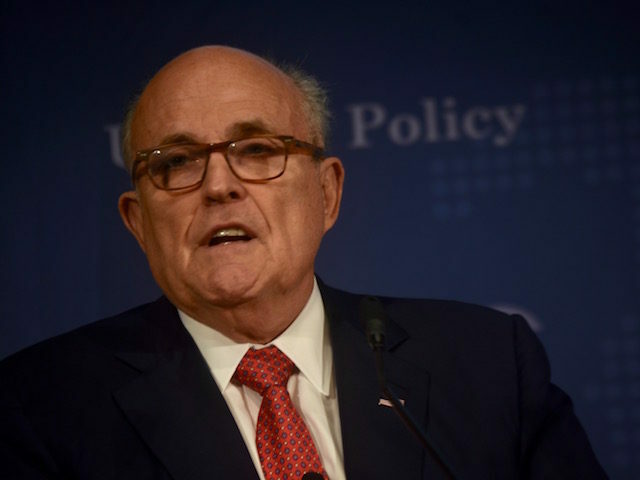 Giuliani said he has been friends with Rajavi, who lives in exile in France, for many years and supports her ten-point plan for the future of Iran, including separation of church and state, gender equality, free and open elections, and the abolition of the death penalty. Five organizations are represented on the council, including the People’s Mojahedin Organization of Iran (PMOI/MEK), which was founded in 1965 to oppose Iran’s last Shah Mohammad Reza Pahlavi and participated in the 1979 Revolution that overthrew him. The group later broke with Iranian Islamic leader Ayatollah Ruhollah Khomeini over ideology and direction and went underground in 1981. The U.S. State Department designated MEK as a Foreign Terrorist Organization from 1997 to 2012, but the group ultimately proved a valuable asset to the U.S. and its allies after it helped uncover Iran’s nuclear program. Giuliani said he believes that, if the protesters get support from the international community they will succeed and noted that an otherwise divided Iran is united in its opposition to the Islamic regime. “When you start slaughtering your own citizens, you are in a precarious situation,” Giuliani said. Organizers of the event said that, since December, protests have taken place in 142 cities in Iran. Some 65 people have died in the protests, and at least 15 protesters have been jailed.